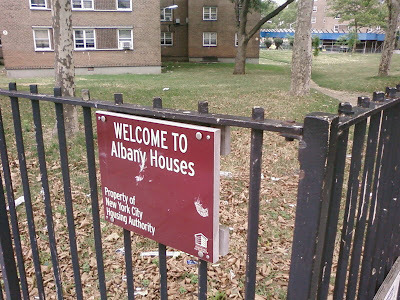 NY1 reported on Thursday that, for the first time in city history, money seized from a narcotics bust is being re-invested in the community it was ill-gotten from, in the form of a teen center for the Albany Houses in Crown Heights. After seizing $35,000 were seized from a drug ring in the NYCHA project, the district attorney's office and the NYPD decided to use the money to open a Police Athletic League space and Teen Impact Center. With the crime ring gone and replaced with chessboards and mentors, the net gain for the teens of Albany Houses is great indeed. ILFA is particularly thrilled about this center. Last June, I sat on a jury for three weeks in the case of a resident of the Albany Houses who was charged with beating a homeless man, Stephen Ingram, to death. The defendant had committed the crime as a teenager, and he and the witnesses, still in their teens or barely out of them, did not hold their own or other lives in particularly high regard - perhaps a product of the extremely truncated set of opportunities available to them - and were deeply distrustful of and antagonistic to authority (not without reason - as we learned during the case, the primary investigative strategy employed by the police in their area seemed to be picking up kids their age and threatening to pin any number of crimes on them until they talked). It's foolish to speculate, but if these young men had had access to this center, where they would have encountered police officers in a friendly setting and shared in activities that build mutual respect and widen horizons, perhaps the awful violence of September 29, 2007 might have been avoided. Let's hope this novel use of seized cash becomes a regular policy in Brooklyn. Two weeks ago, the lady and I headed to Lily & Fig for Valentine's Afternoon Tea, and were richly rewarded for our efforts (a four-block walk and the anti-Manhattan sum of $16 each). The three-course prix fixe included a light, ever-so-slightly sweet bowl of parsnip and ginger soup (a nice twist on a British classic - this was TEA, after all), three tea sandwiches on homemade bread with a salad of crisp greens and crunchy apples, and, for dessert, a sugar cookie, a rum truffle (the lady like it so much she had to get another), and a sweet mango chutney, washed down with a cup of tea, of course (I went with Yerba Mate - for those who don't know, Lily maintains a wide collection of teas and other infusions). The meal, which we ate in the afternoon sun at the front of the cafe, was prepared by local chef Kendra (a fellow blogger - check her out at Media Harvest), with Lily providing the cookies and truffles. Lily & Fig doesn't usually offer full meals (though their pot pies are quick, delicious, and filling), but Lily and Kendra are hoping to put together another special event like this sometime soon. If they do, don't miss it - the food was fantastic. In other Avenue food news, Island Thyme (formerly Bristen's) launches tomorrow at 10 AM for brunch, and the absolutely gorgeous new Chavella's is aiming for a late-March opening. - The Kings County Cinema Society celebrates Black History Month at LaunchPad with "Story of a Three Day Pass," starting at 8pm. - New Kings Democrats, Prospect Heights Democrats for Reform, and a host of other Brooklyn political clubs host a screening of "Gerrymandering" at the Brooklyn Public Library. The show starts at 6pm with a discussion of the process featuring Assemblyman Hakeem Jeffries, State Senator Daniel Squadron, and director Jeff Reichert. Last month, Brooklyn Independent Television came out to Crown Heights to interview yours truly for their "Walk Around the Blog" segment. It aired this past week - check it out. Apologies to all the great organizations, businesses and people I didn't get a chance to talk about. 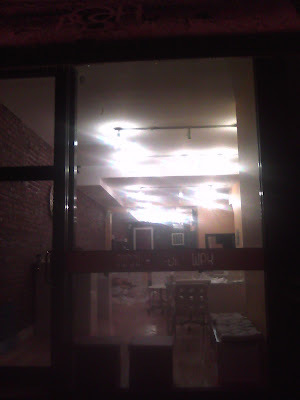 If you're in need of a wicked good manicure or pedicure, look no further than 666 Franklin Avenue, the new home of Posh Nails BK (ILFA will be sending the lady in on a fact-finding mission - she also took the photos above this evening). Their launch kicks off a season of new openings that will include Island Thyme (see below), Compare Foods, Chavellas, two pizza places (Barboncino and another at Prospect and Franklin), and Sweet Basil. Of course, we've also just lost Oaxaca and Bristen's, so it's clearly still a tough world out there for a small business. If you give these new local spots a try, let us know how you like them (and let them and Yelp know, too). So I was their first ever customer (outside of private events last week) so they were a bit flustered feeling -- trying to find things, opening new packaging, etc. -- but everything that is to be expected on day 1 of a new business. Tonight to celebrate their first day they are having free cocktails with any service from 5pm-7:30pm. On Tuesdays and Wednesdays (so today!) they have $27 mani/pedis which seems like a good deal. And tonight it comes with a drink. They also do a bunch of other mani/pedi add-ons and they do waxing as well. Good polish color selection too. I don't mean to sound like I'm selling the place, but I was there for 2 hours and everyone was incredibly nice, the service was great, and I'm very pleased with my manicure. I HATE the place on Franklin Avenue near Eastern Parkway and I didn't like having to trek over to Vanderbilt for a good manicure, so I am just very excited about this place. 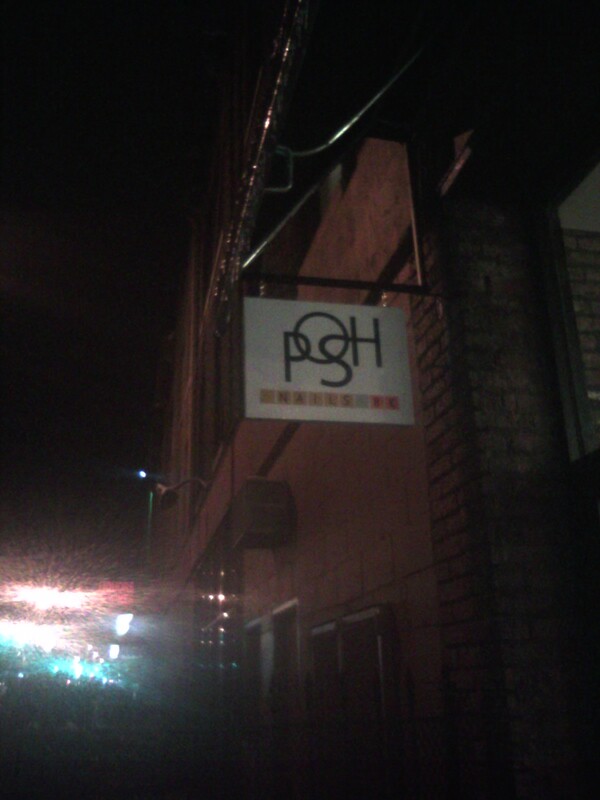 The lady snapped this photo of the new sign at Bristen's. 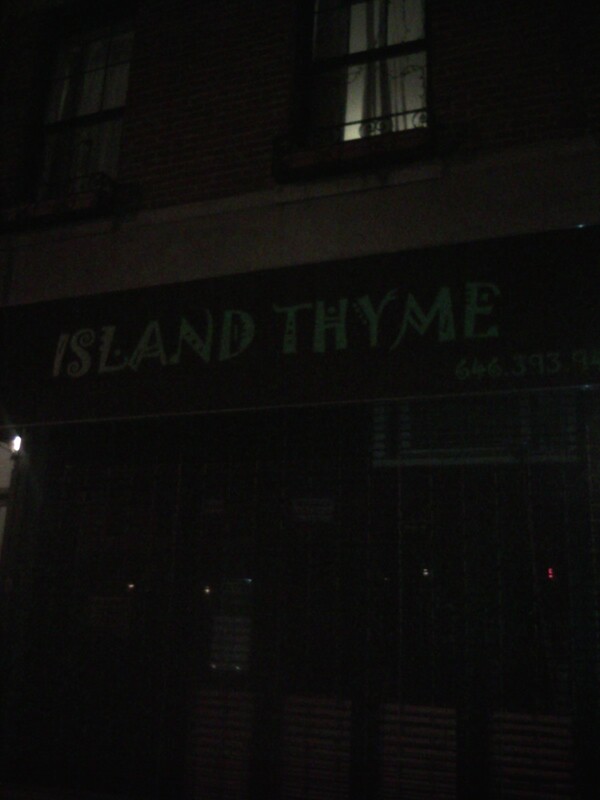 Based on this, I think it's fair to assume that Island Thyme will be opening up there (though what I don't know is whether or not it will be managed by the same people). Nostrand Park has more here (and to be fair, they had the scoop first). And it's a regular thing now! Someday I'll actually develop a calendar widget for this blog so I can plug things like this into it. "Now, the attack of the fish-tank condos is pushing the boundary of Prospect Heights eastward into Crown Heights, an in-between neighborhood that realtors and developers have dubbed ProCro. The result is a mingling of million-dollar condos and sleek wine bars with creaky, rent-controlled buildings and graffiti-pocked bodegas." 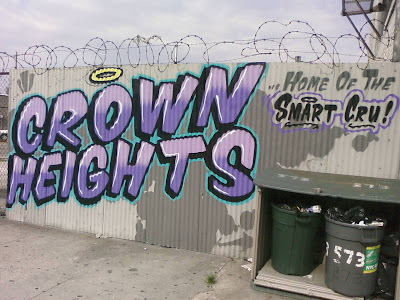 - The Journal followed their article up with a blog post suggesting that the "Past in Crown Heights is Baltimore's Present". - Curbed jumped on the "border war" at work in the article's definition of the area. - Gothamist fired off their standard-issue gentrification news re-post. - Prospect Heights Patch claimed the entire area west of Bedford for Prospect Heights. - The Brooklynians and Brownstoners weighed in. I'm not feeling up to a sensible reflection on any of this on account of information overload, but there is a tone that runs through much of this discussion that doesn't sit terribly well with me (Nostrand Park, who led off the discussion on Brooklynian, took issue with the article's characterization of CH, and I agree with them). Whether it's the initial article passing off the West Indian Day parade (one of the largest street festivals and celebrations of Caribbean culture in the world) as a post-riot "Caribbean festival" that makes the neighborhood more desirable for condo-building or the language of colonization/invasion deployed in so much of this discourse, I feel like a) I'm not learning a lot from it and b) it's not offering a very accurate or nuanced portrayal of what's actually happening in the neighborhood. Even the snarky mockery that lots of blogs/comments employ strikes me as unproductive - it's easy to poke fun at the gentrifyers, but that seems to be a project for justifying one's own authenticity/self-awareness in the context of neighborhood change (and to raise a question that was raised of this blog in comments in the post below, I wonder how many of the people commenting on this WSJ article are CH residents, and what demographic they're in). Also, this "condo boom" hasn't been seamless at all, and the story doesn't reflect that - there's still a huge hole at Franklin and Eastern, where one of these glassy condos was supposed to go, there are more holes or half-built hulks rotting over on St. Marks and Bergen just east of Grand, many of these buildings took far longer to complete than they were supposed to, and despite the official sales stats, I'm not convinced anyone actually lives in some of them (like Ishi). The condo boom might be peripherally indicative of neighborhood change, but it's definitely not at the heart of the story. This post is rapidly losing coherence - meanwhile, the 77th Precinct is under the gun for manipulating crime statistics, and their beat saw a significant bump in several crime categories last year (this, I think, is news). Readers, your thoughts? Beyond Bristen's - What's Next for Franklin? "However, with the rapid changes, I think it is also important to also step back and look at the macro perspective on this, and consider whether the retail mix as a whole is reflects the needs of the broader community . . . while the wants, needs, and spending power of the newer residents are and should be a very real factor in determining the success of Franklin Avenue as a commercial district, it is just as important to factor in the wants, needs, and the collective economic potential of residents of lower-incomes." Laurel also pointed out that the retail environment on Franklin has gotten increasingly competitive, a factor which drives development but which can also produce a here-today-gone-tomorrow business environment, one that damages communities by damaging continuity. Mike F commented that "the city is changing. To try to stop it is futile; the goal is to try and keep up," but I'd argue that the real challenge is to harness, direct, and channel change in ways that benefit and strengthen neighborhoods. This doesn't mean standing athwart history yelling "stop," but rather thinking about strategies for engaging local residents, retailers, and landlords in conversations to address the questions Laurel is raising (on Franklin, the CHCA and the Franklin Avenue Merchants Association are brainstorming about these issues). To add my own concerns to the mix, I think a retail mix that serves our heterogeneous community is important, but I also think businesses have the potential to act as public spaces where members of these diverse groups come together and actually build community. Ultimately, Bristen's didn't have the goods to match their do-gooding. So where to from here? From what I understand, the Bristen's space will be replaced by a Caribbean place called "Island Thyme." Some posters worried about "another Caribbean joint," but I think this place, in this space, would/will be great. When ILFA got started two and a half years ago, there were three Caribbean places on Franklin between Eastern and Park (The Spice is Right, 3D's, and the space now occupied by J's Wong), and a fourth, JamRock Kitchen, opened shortly thereafter. Today, only JamRock remains (though supposedly 3D's is not gone for good). In a month or so, Franklin will have more coffee houses, Mexican places (Chavella's opens next month), and Thai places (once Sweet Basil opens) than West Indian joints, a change that gets to the heart of Laurel's concerns. In a historically West Indian community that remains majority Afro-American and Afro-Caribbean (according to the most recent census), having a nice new Caribbean restaurant in a cozy space does two important things - it demonstrates that gentrification/revitalization/neighborhood change doesn't just have to be about nice things for newcomers, and it provides a place for social and cultural exchange that benefits all parties involved. I realize this is a lot of aspirational language to pin on a new merchant who's likely more concerned about his/her bottom line than being part of a blogger's Kumbaya project. Still, returning to Mike's point, communities in this town are inherently transient things, and their fates can swing on tiny hinges. Maybe Island Thyme won't have us all holding hands around a bowl of stew peas, but it can, I think, provide the opportunity for interaction. What we make of these interactions is up to us. The Crow Hill Community Association will be hosting their monthly meeting tonight at LaunchPad (721 Franklin) from 7:30 - 8:30 pm. 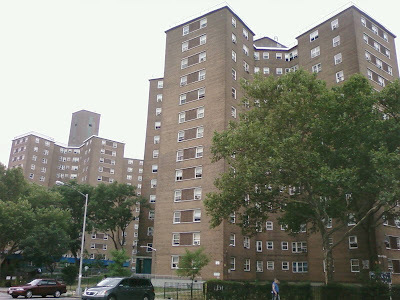 For those who aren't familiar with the CHCA, they're the neighborhood's leading civic organization, and they do a great deal for the residents of "Crow Hill" (Northwest Crown Heights). If you're new to the area, these meetings are a great way to get to know your neighbors, learn about the rich history of the community, and get involved in addressing the challenges that all local residents face. You can check out their various initiatives at their website and their blog. 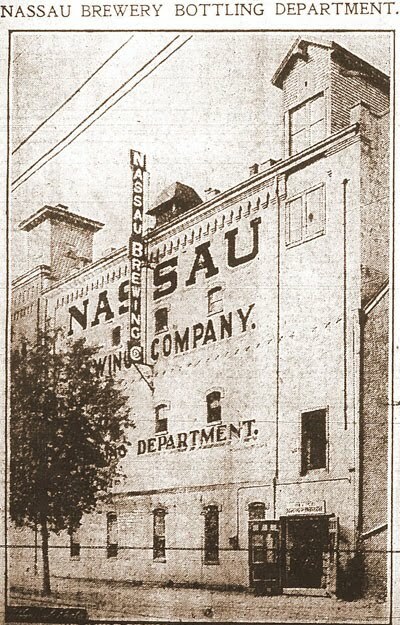 On the docket for tomorrow night's meeting (which ILFA is dismayed to be missing) is a discussion of the future of the brewery complex on Franklin between Bergen and Dean (pictured above in 1907 - that building, on Bergen, now reads "Heinz" in faded lettering). Ideas on the table include landmarking and renovation for community use, which will entail working with the city and the developer(s). This sort of discussion goes to the heart of the questions Laurel, Mike, and others have been asking of last Friday's post, and while it's too late now for extended ruminations, I'll likely devote more space to these issues later this week. Regarding the brewery complex, it's one of ILFA's absolute favorite buildings on Franklin, and half of it has already been renovated to some acclaim. The Franklin side of of it, however, remains mostly lovely (I'm not a huge fan of the various cinder-block additions that occupy the Dean Street end of things) and empty. While I love the idea of a preserved public space, funding for developments of this size remains very tight and landmarking (if the building was indeed landmarked before construction began) makes any sort of renovation considerably more time-consuming and expensive (I'm sure the folks at the CHCA know this, but it bears mentioning). One potential route to developing the space would be with city money, which is also scarce, but recently reared its head in the form of an RFP for a Central Brooklyn small business incubator. All that said, if all the parties involved can come to the table in a spirit of creativity and compromise, the potential for a beautiful project is lurking at that site. Whether you prefer sweet talk, love poetry or heart-to-heart chats, celebrate Cupid's holiday with Pulitzer Prize nominee COLSON WHITEHEAD (Sag Harbor, The Intuitionist), debut novelist ALISON ESPACH (The Adults), memoirists MIRA PTACIN (Freerange Nonfiction) and MILTON WASHINGTON (Slickyboy), and poet DAVID MCLOGHLIN (Waiting for Saint Brendan). Be our Valentine, and we'll set the mood with candy hearts, romantic cocktails, and $4 pints. COLSON WHITEHEAD is the author of the novels Sag Harbor, The Intuitionist, John Henry Days, and Apex Hides the Hurt, and the essay collection The Colossus of New York. His books have received numerous accolades, including the Young Lions Fiction and the Anisfeld-Wolf Book awards, and were selected as finalists for the Pulitzer Prize, the National Book Critics Circle Award, and the PEN/Hemingway and PEN/Faulkner awards. His reviews, essays, and fiction have appeared in many publications, including the New York Times, The New Yorker, New York Magazine, Harper's, and Granta. A recipient of a Whiting Writers’ Award and a MacArthur Fellowship, he lives in Brooklyn (and keeps a spectacular Twitter feed). ALISON ESPACH is the author of the debut novel The Adults, which has been named a Barnes & Noble Discover Great New Writers pick for Spring 2011. She received her MFA in Fiction from Washington University in St. Louis, where she taught creative writing. Her short fiction has appeared in McSweeney's, Del Sol Review, and Sentence. A Brooklyn resident, she is currently teaching in New York City. MIRA PTACIN is the founder and curator of the Freerange Nonfiction Reading Series. She holds a Master’s Degree in creative nonfiction from Sarah Lawrence College, and is a graduate of the Salt Institute for Documentary Studies in Portland, Maine. She is the former editor-in-chief of the literary magazine, LUMINA, and has led workshops for a literacy program at the Women’s Unit of the Westchester County Correctional Facility. Mira also served as a Writer-in-Residence at the Bronx Academy of Letters, where she helped students produce a literary magazine. Her writing has appeared in numerous publications, including New York Magazine, Nerve.com, Epiphany, LUMINA, Cerise Press, and The Sunday Salon. Most recently, Mira ghost-wrote and sold a children’s book to Disney-Hyperion, which will be released in April. She lives in Brooklyn with her husband and two dogs. DAVID MCLOGHLIN is an MFA student at NYU. Born in Dublin, Ireland, he has lived in Belgium, Spain, France, and the United States, and worked as teacher, freelance translator /editor, dish-pig, and professional guest. His writing has appeared in several Irish literary journals, including Cyphers, Poetry Ireland Review, The Shop, and The Stinging Fly, where he was a 2009 featured poet, and Milwaukee’s Blue Canary Press published a chapbook of his poems. He won the English section of the Frances Browne Multilingual Poetry Competition and second prize in The Patrick Kavanagh Awards, Ireland's most prestigious award for an unpublished first collection of poetry. Currently, he blogs at newyorkperistalsis.wordpress.com. Salmon Poetry will publish his first collection, Waiting for Saint Brendan in June 2012. MILTON WASHINGTON was born in South Korea, then adopted and brought to the United States in 1979. He attended Northwestern University on a football scholarship, but dropped out due to an injury. He earned a BA in Computer Information Systems from Indiana University. He has worked for a Fortune 500 engineering company and held positions in media sales and business development. A New York City resident, he is working on a memoir called Slickyboy. Valentine's Day in NYC can be a world of hurt for your wallet, which is all the more reason to keep things local. If you haven't made reservations yet, ditch the ritzy Manhattan scene on Monday night and have a relaxed Sunday Afternoon Tea at Lily & Fig (and don't forget the flowers at Park Delicatessen). It's called a "tea," but this is a legitimate meal (a "tea" in the old-school British sense, if you like), featuring three courses from an up-and-coming local chef. Click the second photo above to see the menu - soup, sandwich, and salad, topped off with delicious sweets and treats from Lily's bakery and some tea (of course). The best part? It's only $16 per person and you don't need a reservation. Just come by with your loved ones and some friends and enjoy. 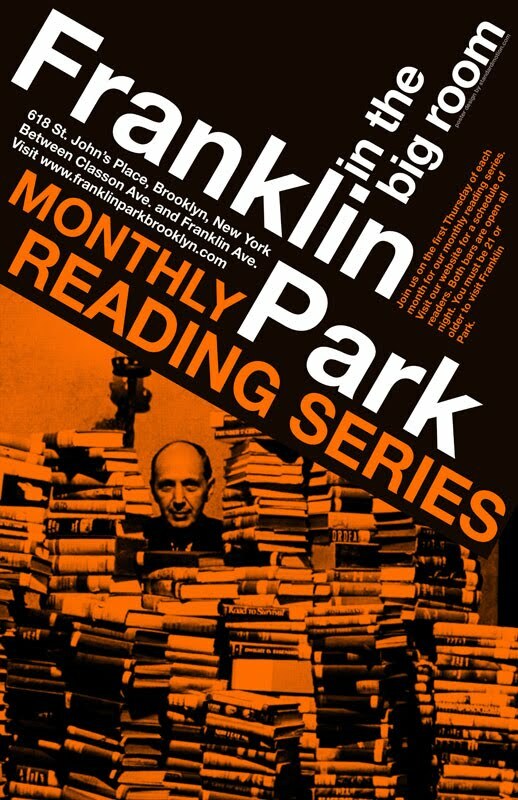 If you absolutely must do something on Valentine's Day proper, you can still keep it in the neighborhood by checking out "Love Stories" at the Franklin Park Reading Series at 8pm on Monday night, with their usual cozy atmosphere and drink specials. - Chavella's new location on Franklin is looking lovely, with a fresh coat of paint and some wrought-iron window screens. For those of you with a penchant for peeking through construction fences, take a look - the interior looks gorgeous, too - high ceilings, tile, and a long bar. - The new Thai place next to the Laundromat at Franklin and Park, Sweet Basil (which doesn't seem to be affiliated with the Woodside restaurant of the same name), has its signage up and looks well on its way to completion. For those still miffed about the illegal tactics the landlord used to bring a pawn shop to Park Place, it's worth noting that this is one of his properties (along with the laundromat next door). The owners of the Thai place likely didn't know what they were getting into (and may well have signed the lease before the pawn shop situation blew up last October), and I don't know the current status of the boycott called by the CHCA and others, but I figured I'd put the information out there. Anyone know anything more regarding this place/the boycott? - Finally, 666 Franklin, which will be a high-end nail salon, was looking shiny and new this morning (from what I've heard through the grapevine, they're slated to open in a few weeks - check back here and at the Franklin Avenue Merchants website for more info). Brooklyn has been a bastion for all manner of start-up businesses for centuries, and over the past couple decades it's become a veritable hotbed for new ideas, not least because of the creative cache that's come to be associated with the borough (witness the competition between two small-batch gin distillers for the Brooklyn name, despite the fact that moonshine-making has only been legal for a year in New York State). Residents of Franklin are no strangers to this phenomenon, as evidenced by the double-digit entrepreneurial explosion on the Avenue over the past few years. Now, the City's Economic Development Corporation (NYCEDC) is getting involved, announcing last week that they are issuing a Request for Proposals (RFP) to bring a small-business incubator to Central Brooklyn. The NYCEDC's incubators, of which Central Brooklyn's will be the ninth, are part of the Corporation's Affordable Workspaces programming, which seeks to make space for great ideas in the hyper-competitive, uber-expensive New York City environment. The incubators are often geared around a central theme - the first, at 160 Varick, offered shiny corporate-style offices to start-ups, while others have included a fashion workshop in the Garment District and artist's studios in the Brooklyn Army Terminal. For their latest effort, the EDC is thinking with their stomachs, encouraging proposals for a "food-use" incubator. This could include food storage, manufacturing, and commercial kitchens, and might end up looking and feeling somewhat similar to the Hot Bread Kitchen Incubator at La Marqueta in East Harlem. The EDC is seeking a partner to develop, operate, and maintain the incubator, and has allocated over one million dollars for capital costs related to the project. While the proposal expressly names Bed-Stuy, Crown Heights, Brownsville, and East New York as its preferred locations, it is also offering prospective developers space in the basement of the city-owned Moore Street Market in East Williamsburg. With all due respect (and as a Crown Heights homer), this incubator should aim for a more central location, one with excellent transit and a thriving small-business culture as well as ample former-factory space just waiting to be converted . . . Four Corners, anyone? In all seriousness, with the A-C and 2-3-4-5 nearby, an incubator in our area would be easily accessible to all four of the neighborhoods named in the RFP, as well as proximate to a number of booming business districts. What more could you ask for? Readers - would you like an incubator in Crown Heights? Where would you like to see it? ILFA is a huge proponent of shopping local, so this year, ditch the generic mail-order flowers and get your loved ones something with a little neighborhood flavor from Park Delicatessen. Local merchants, let us know if you're planning any Valentine's Day specials or sales, and we'll post them here. Shoppers, check this space and the Franklin Avenue Merchants website for up-to-date information on ways to support your local businesspeople. As for the evening itself, ILFA recommends a lovely dinner at a local establishment followed by the cozy comforts of the Franklin Park Reading Series. Seasonal Arrangement of fresh cut flowers in Recycled can. As the masthead of this blog demonstrates, I'm a bit biased when it comes to Franklin Avenue, and every now and then I like to just sit back and sing the praises of the neighborhood. On Saturday, the lady and I dragged ourselves out of bed for a run in the midst of a terrible, horrible, no-good, very bad day. It was 34 degrees. It was raining. The rain was cold. The slush was cold. The world was cold. Cold and dark. Our running companion, a native of St. Petersburg (that's Russia, not Florida), mentioned that his mother uses a Russian saying to describe such days, one that loosely translates to "this is a good day for borrowing money to go drinking." I decided to opt against boozing at noon, but I went for the next best thing: a huge meal at Kelso, Franklin Avenue's (and by extension, Brooklyn's, and maybe NYC's) one true Panamanian Restaurant. 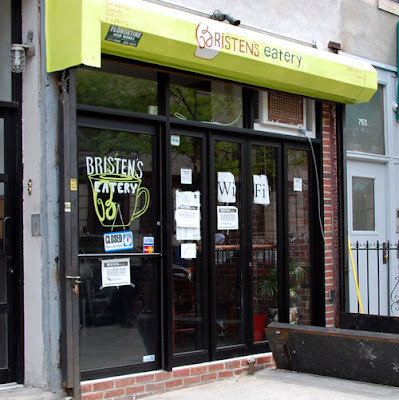 Kelso gets left out of the discussions about Franklin's rapid rise because it sits so far north (between St. Marks and Bergen) and because it was here before many of the hot new spots, but make no mistake, this is one of the best places to eat in all of Crown Heights. A "daily special" costs somewhere between $7-10, and includes a huge pile of meat (oxtail, curry chicken, pepper steak, etc), a heap of rice and peas, fried plantains, and a side salad, all served with the delicious hot-and-tangy yellow sauce that's served in a sugar bowl (Panamanian cuisine is a wonderful mixture of Latin American and Caribbean flavors, on account of the historic migration of West Indians to the canal zone). Sitting at the bar, chatting with the exceedingly friendly wait staff and listening to the radio, one could almost forget the "wintery mix" outside. Franklin Avenue was once the center of Panamanian America, and still hosts the annual Panama Day Parade, as well as a number of local businesses that serve emigrants from the Isthmus. Thanks to this heritage, you can enjoy some of the best of what Panama has to offer at Kelso, even if you never plan to learn Spanish or sail through the world's most famous canal. - From 11am - 4pm, the NYC Parks Department's annual Winter Jam comes to Brooklyn. The all-ages, all-abilities event offers lessons and competitions in a variety of winter sports, on freshly-made snow. They'll also have live entertainment and a "winter marketplace" for those who prefer to stay on their own two feet. 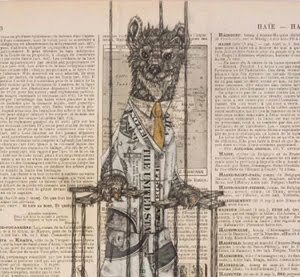 - At 4:30pm, The Page Turners opens at Five Myles Gallery (image above), featuring the work of a dozen up-and-coming artists exploring narrative and storytelling. The opening reception (snacks, wine, and warmth!) runs until 7:30. - Starting at 5pm, the Brooklyn Museum brings back Target First Saturdays. This month's theme is "Framing Our History." - Finally, at 8pm, Hoover Dam Collective returns to LaunchPad as part of their First Saturdays residency with a slew of great performers and performances (complete details here). The weather is supposed to be pretty ugly tomorrow - however, ILFA has learned from experience that a "wintery mix" (aka a miserable ice storm) can be a route to superstardom, or at least a way to get your name in the New York Times, if a chunk of ice happens to target you at just the right time. With that in mind, go forth and brave the elements! 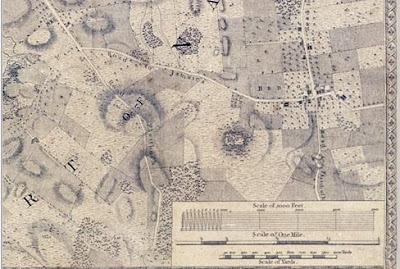 Ever wonder what Brooklyn looked like back when it was still a British colony? In the course of pulling some archival materials out of deep storage last spring, the Brooklyn Historical Society unearthed a copy of an extremely rare map of Lower Manhattan and Brooklyn, Bernard Ratzer's "Plan of the City of New York" from 1770. The find was akin to a miner striking a baseball-sized diamond - including the BHS one, only four copies of Ratzer's map are left - and occasioned a front-page story in the New York Times a few weeks ago detailing the extensive restoration process the BHS undertook. In response to popular demand generated by the article, the Society has just announced that the map will be on display in their lobby through May 1, 2011. The beautiful BHS is well worth the trip, but for those who can't wait, the NYT has also put a web-enhanced Ratzer map online, from which the image above is copied (the BHS has some audio and video online here as well). The map is fascinating for many reasons, but as a hopeless Crown Heights homer, I can't help but point out that, while Franklin Avenue did not yet exist in 1770, the distinctive angles of Fulton, Flatbush, and Bedford still carve out the borders of the farmers' fields that preceded our neighborhoods. Just north of us, the little village of Bedford is visible as a cluster of buildings at the intersection of Fulton and Bedford, where the local school and library branches still bear the Bedford name (as does, of course, the rest of the area). All in all, it's a remarkable reminder that once upon a time, the neighborhood looked like this. With weather like this, it's never too early to start thinking weekend. On Saturday, Brooklyn's own Hoover Dam Collective returns to LaunchPad for the second iteration of their First Saturdays Residency. Click here for complete event details, some of which are copied below. The show starts at 8pm, and like almost everything else at LaunchPad, it's absolutely free (make sure to drop a few bucks in the good karma box on your way out). After the wild success of our first residency show, which took place at the Launchpad on January 8th, we are very excited to present Show 2, which will feature an exciting and diverse line up. Come check it out! This show is absolutely free, and will feature free wine and snacks. 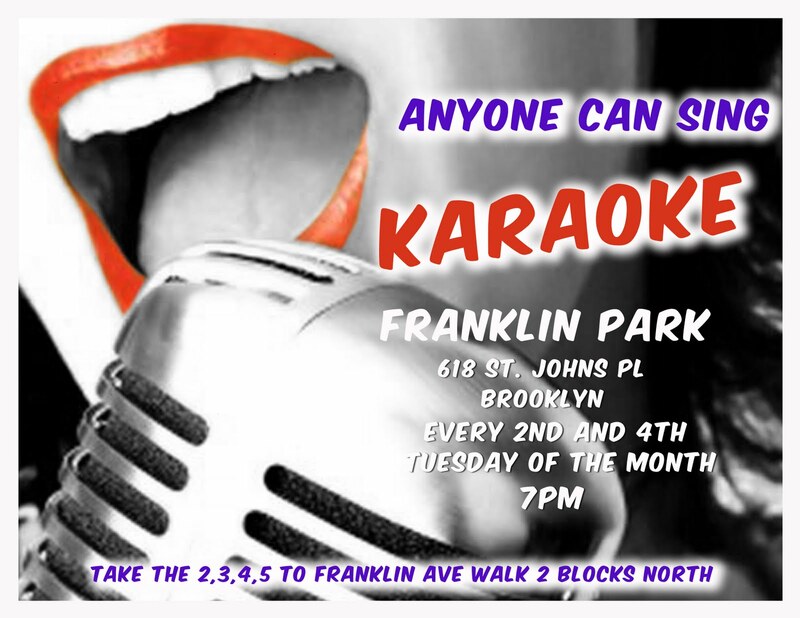 Come in out of the snow and warm up to some fresh new talent! !